A common scenario includes an Amazon RDS DB instance in an Amazon VPC, that shares data with a web server that is running in the same VPC. In this tutorial you create the VPC for this scenario. The following diagram shows this scenario. For information about other scenarios, see Scenarios for Accessing a DB Instance in a VPC. Because your Amazon RDS DB instance only needs to be available to your web server, and not to the public Internet, you create a VPC with both public and private subnets. The web server is hosted in the public subnet, so that it can reach the public Internet. The Amazon RDS DB instance is hosted in a private subnet. The web server is able to connect to the Amazon RDS DB instance because it is hosted within the same VPC, but the Amazon RDS DB instance is not available to the public Internet, providing greater security. Use the following procedure to create a VPC with both public and private subnets. In the top-right corner of the AWS Management Console, choose the region to create your VPC in. This example uses the US West (Oregon) region. In the upper-left corner, choose VPC Dashboard. To begin creating a VPC, choose Launch VPC Wizard. On the Step 1: Select a VPC Configuration page, choose VPC with Public and Private Subnets, and then choose Select. If you do not see the Instance type box in the console, click Use a NAT instance instead. This link is on the right. If the t2.small instance type is not listed, you can select a different instance type. Service endpoints: Skip this field. When you're finished, choose Create VPC. You must have either two private subnets or two public subnets available to create an Amazon RDS DB subnet group for an RDS DB instance to use in a VPC. Because the RDS DB instance for this tutorial is private, add a second private subnet to the VPC. To add the second private subnet to your VPC, choose VPC Dashboard, choose Subnets, and then choose Create subnet. Choose an Availability Zone that is different from the one that you chose for the first private subnet. When you're finished, choose Create. Next, choose Close on the confirmation page. To ensure that the second private subnet that you created uses the same route table as the first private subnet, choose VPC Dashboard, choose Subnets, and then choose the first private subnet that you created for the VPC, Tutorial private 1. Below the list of subnets, choose the Route Table tab, and note the value for Route Table—for example: rtb-98b613fd. In the list of subnets, deselect the first private subnet. In the list of subnets, choose the second private subnet Tutorial private 2, and choose the Route Table tab. If the current route table is not the same as the route table for the first private subnet, choose Edit route table association. For Route Table ID, choose the route table that you noted earlier—for example: rtb-98b613fd. Next, to save your selection, choose Save. Next you create a security group for public access. To connect to public instances in your VPC, you add inbound rules to your VPC security group that allow traffic to connect from the internet. Choose VPC Dashboard, choose Security Groups, and then choose Create security group. To create the security group, choose Create. Next, choose Close on the confirmation page. Note the security group ID because you will need it later in this tutorial. Determine the IP address that you will use to connect to instances in your VPC. To determine your public IP address, you can use the service at https://checkip.amazonaws.com. An example of an IP address is 203.0.113.25/32. If you are connecting through an Internet service provider (ISP) or from behind your firewall without a static IP address, you need to find out the range of IP addresses used by client computers. If you use 0.0.0.0/0, you enable all IP addresses to access your public instances. This approach is acceptable for a short time in a test environment, but it's unsafe for production environments. In production, you'll authorize only a specific IP address or range of addresses to access your instances. Choose VPC Dashboard, choose Security Groups, and then choose the tutorial-securitygroup security group that you created in the previous procedure. Under the list of security groups, choose the Inbound Rules tab, and then choose Edit rules. Set the following values for your new inbound rule to allow Secure Shell (SSH) access to your EC2 instance. If you do this, you can connect to your EC2 instance to install the web server and other utilities, and to upload content for your web server. Source: The IP address or range from Step 1, for example: 203.0.113.25/32. Set the following values for your new inbound rule to allow HTTP access to your web server. To save your settings, choose Save rules. Next, choose Close on the confirmation page. 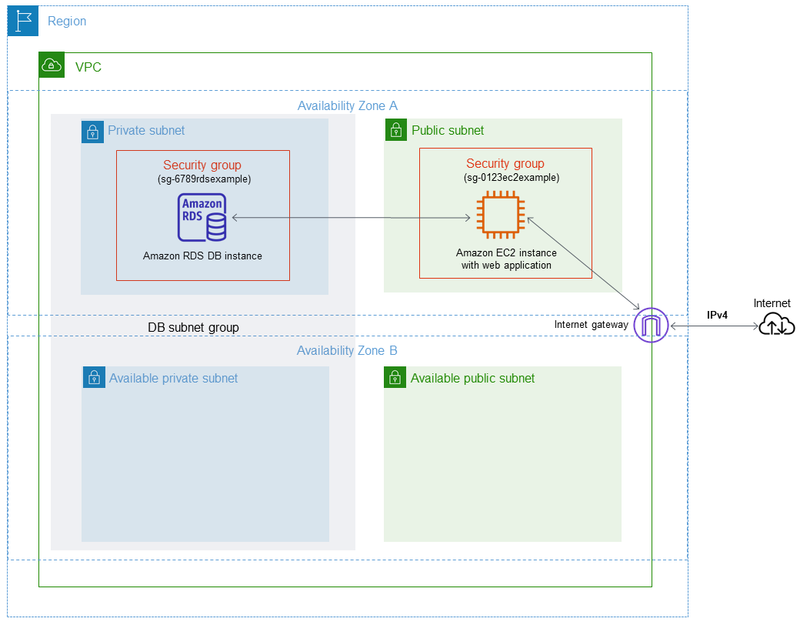 To keep your Amazon RDS DB instance private, create a second security group for private access. To connect to private instances in your VPC, you add inbound rules to your VPC security group that allow traffic from your web server only. Choose VPC Dashboard, choose Security Groups, and then choose the tutorial-db-securitygroup security group that you created in the previous procedure. Set the following values for your new inbound rule to allow MySQL traffic on port 3306 from your EC2 instance. If you do this, you can connect from your web server to your DB instance to store and retrieve data from your web application to your database. Source: The identifier of the tutorial-securitygroup security group that you created previously in this tutorial, for example: sg-9edd5cfb. A DB subnet group is a collection of subnets that you create in a VPC and that you then designate for your DB instances. A DB subnet group allows you to specify a particular VPC when creating DB instances. In the Add subnets section, choose Add all the subnets related to this VPC. Your new DB subnet group appears in the DB subnet groups list on the RDS console. You can click the DB subnet group to see details, including all of the subnets associated with the group, in the details pane at the bottom of the window.